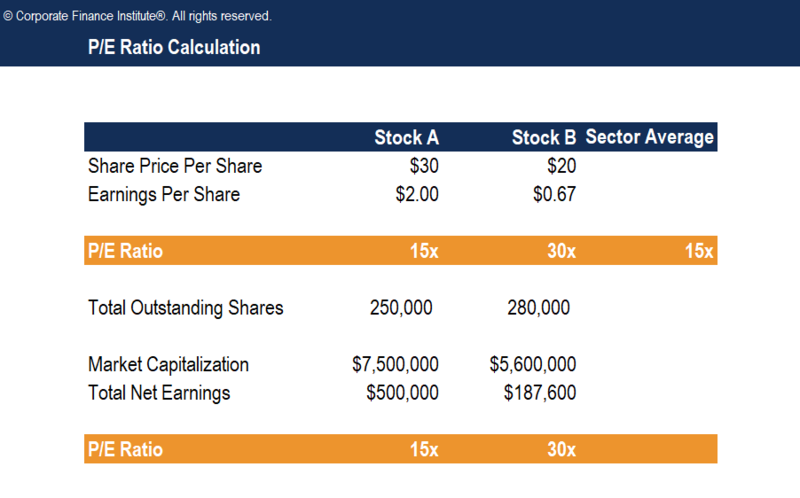 This P/E ratio template will show you how to calculate the Price-to-Earnings multiple using share price and earnings per share. The Price Earnings Ratio (P/E ratio) is the relationship between a company’s stock price and earnings per share (EPS)Earnings Per Share Formula (EPS)The Earnings Per Share formula is a financial ratio, which counts net earnings against the total outstanding shares over a fixed period of time. A higher EPS ratio indicates a company’s ability to generate profits for common shareholders.. It is a popular ratio that gives investors a better sense of the valueFair ValueFair value refers to the actual value of an asset - a product, stock, or security - that is agreed upon by both the seller and the buyer. Fair value is applicable to a product that is sold or traded in the market where it belongs or in normal conditions - and not to one that is being liquidated. of the company. The P/E ratio shows the expectations of the market and is the price you must pay per unit of current earnings (or future earnings, as the case may be).